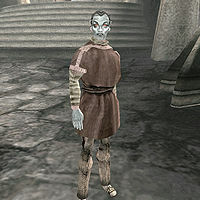 Assi Serimilk is a Dunmer miner who wanders the streets of Maar Gan. She is a sleeper for the Sixth House, and if you spot her at night, she will greet you with a message from Dagoth Ur. If you slay Dagoth Draven in Subdun, she will awaken from her trance. Ask her about "Sixth House" and you will earn a point of Reputation. Assi wears a common shirt, pants, belt, and shoes along with a crimson despair amulet. She carries a miner's pick and her house key. Aside from her natural resistance to fire and the sanctuary provided by her ancestors, she knows no spells. This page was last modified on 8 March 2017, at 02:42.